My critique: Firstly, my home does not need to be saved from being “parched”. What part of the house is damaged by dry air? 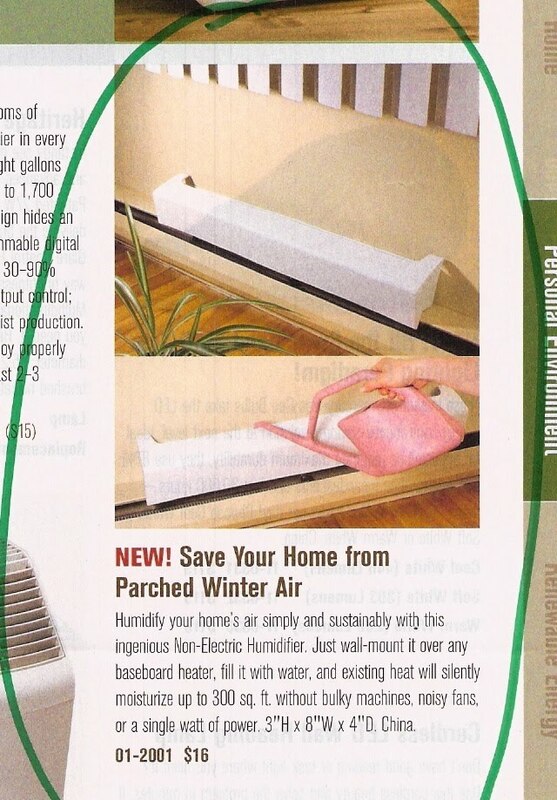 Perhaps they mean save the home’s inhabitants from being parched– in that case, I refer the reader to last year’s posts discussing why it is not winter that causes air to feel dry– it is over-heating the house (here, here, and here.) Yes, if you insist on a hot house in winter, you will parch yourself. So you should turn down the thermostat, rather than buy gadgets to add artificial humidity to artificially hot air. Secondly, the purveyor’s assertion that their “ingenious” plastic pan moisturizes the house “without… a single watt of power” is misleading. True, you don’t have to plug it in. But turning liquid water to vapor requires large quantities of heat, no matter how you do it. The fact that the unit does not have its own source of heat does not change the amount of heat it needs to do its job. In this case, that heat is supplied by the baseboard heater over which the device is located. Whatever fuel is being used to heat the house– electric, gas, oil– some of that will now be used to evaporate the water, at the expense of warming the room. Specifically, for every gallon of water poured into the device, you’ll need to burn close to an extra pint of fuel oil (or equivalent) just to make water into steam. And you don’t get that back as warmth– before long all that water vapor finds its way outdoors, and the heat poured into making it is lost. In the final analysis, this device is no greener, or more sustainable, or even more useful, than gently simmering water in the tea kettle you already have on the cooking stove you already have. But again, I don’t recommend that, either. This entry was posted on October 22, 2009 at 1:43 pm and is filed under Misleading Products. You can follow any responses to this entry through the RSS 2.0 feed. You can leave a response, or trackback from your own site.